Yes, I am untidy! My desk often looks like an explosion at some weird combination engineering, computer and plastics factory. On the odd occasion even I get miffed and have a tidy up. While I was cleaning I kept finding SD cards. Having got loads for my camera and RapsberryPi, I needed a way to store them tidily and I turned to the ‘net. Sure I could have brought any number of card cases, but then I looked over at my Huxley which I was sure was bouncing there shouting “USE ME YOU IMBECILE!”. 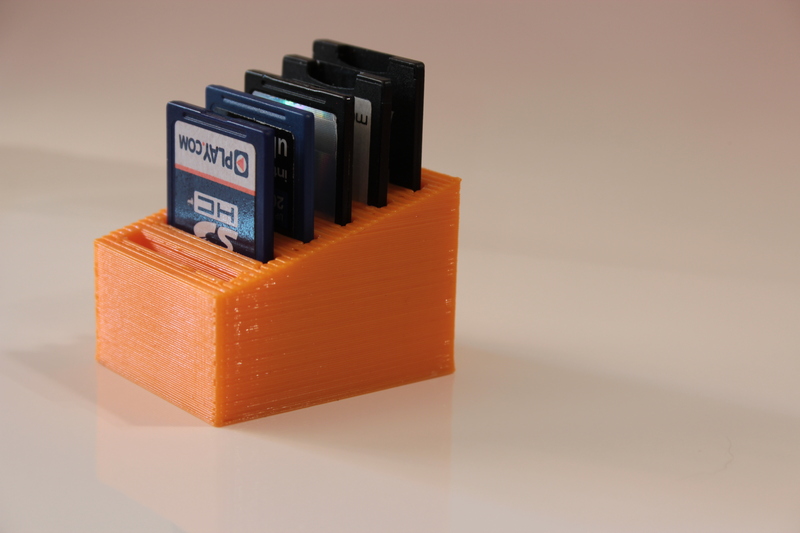 So I hit up Thingiverse and found a parametric SD card holder. Perfect for my needs. I got the Huxley up and running while I carried on cleaning. 30 minutes later it was printed and I was able to store my cards nice and neatly. So now when I am asked why I own a 3D printer I’ll tell them that story. After all it would have cost me much more to buy a holder that probably wouldn’t have fitted my needs so well and it would have taken me days to receive it. As it stands the print cost me about £1 and took no more than an hour from investigation to final product.